INSIDE : A complete 101 guide to all things Marbling! Includes what are marbled crafts, what marbling DIY supplies you need and what are the best items to marble! Marbling has become such a popular crafting technique in the last few years and I fully support it! I have done about 20 different marbled projects using all different types of materials. 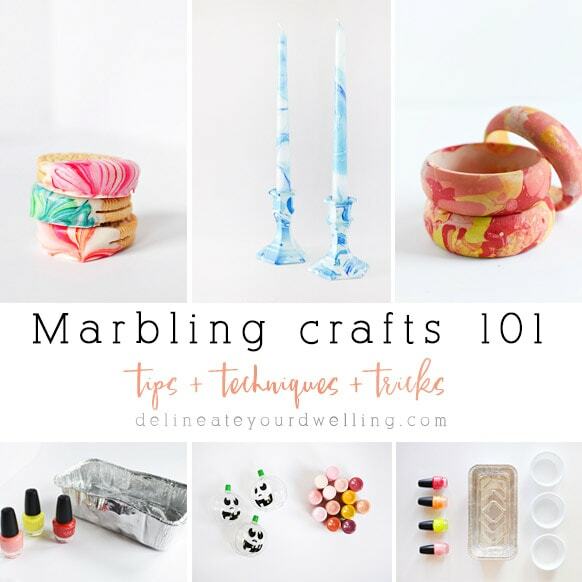 There are so many different types of marbled craft techniques from using nail polish, shaving cream, clay and there is even marbling food – so there is really something for everyone! Today I will be sharing my Marbling 101 Tips, Marbling Techniques and Tricks. I tried my first marble craft project in 2014 (a Marbled Room Diffuser) and over the years, I have learned a few new things and figured out many neat new techniques that helps make the marble crafting process go so much easier. 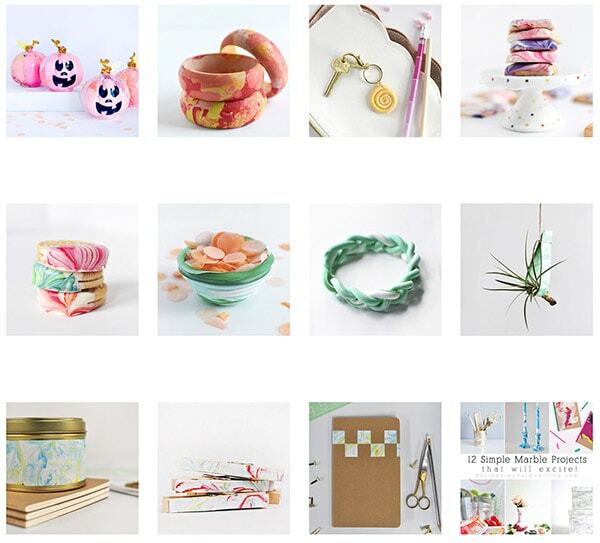 PLUS, did you know I wrote a book that is completely dedicated to marbling crafts — Make your Own MARBLED Creations BOOK! Be sure to check it out. I also shared 12 of my favorite marbled projects that will excite from across the internet in a fun roundup post. 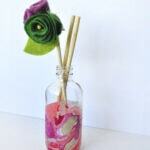 That post has been very popular on my blog and also on Pinterest! Ok, so by now you already know you like the look of marbled projects and crafts but you probably have a few questions before diving in head first. When did people start to marble as a craft? 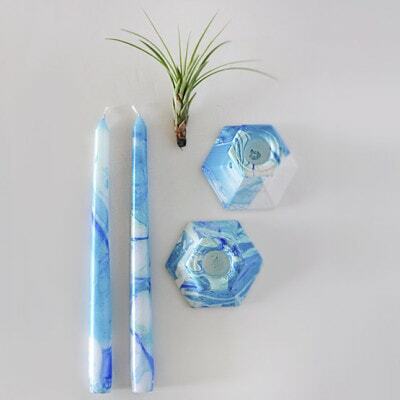 Marbling crafts is a creative technique that has really become a fun trend in recent years. 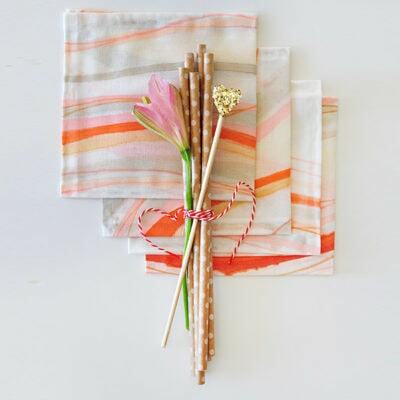 The art of marbling and using marbled decorative objects has a long history dating back to Japan, as early as the 12th century. The very first forms of marbling were practiced in a technique called ink floating. Ink floating is adding swirled patterns of ink or paint to the surface of water and then dipping paper or various objects into the water. However, in the last few years DIY craft marbling has become a creative technique that anyone with any skill level can try and succeed at. Plus, I love that there is immediate gratification for marbling projects. 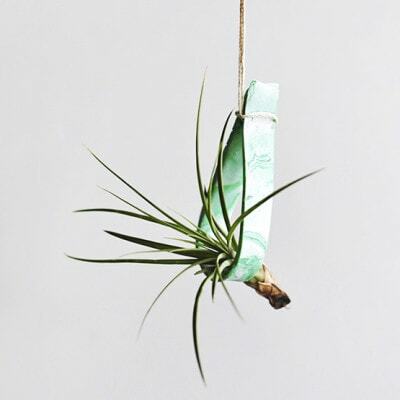 Without much effort at all, you can almost always come up with a GORGEOUS end product! 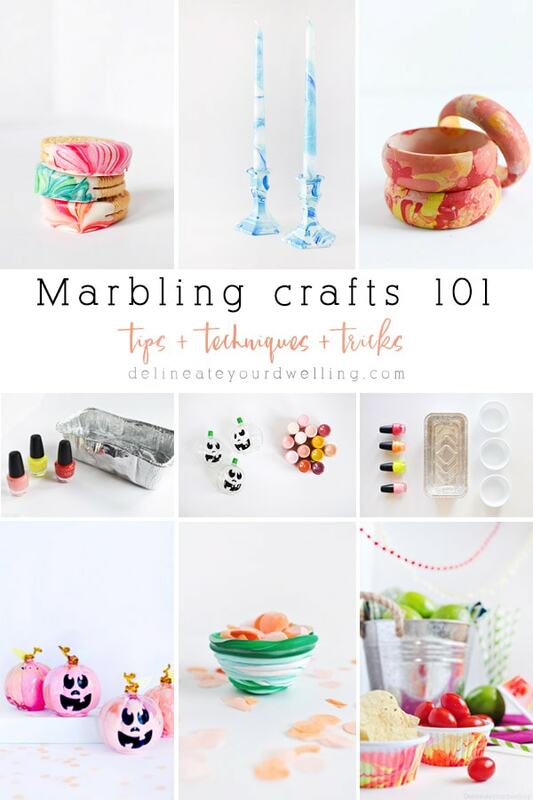 And did you know I just wrote a REAL LIFE book all about marbling crafts?? Yes, I am a published author — Check out my Make Your Own Marbled Creations book!! What Marbling supplies do I need? There are quite a few different marbling techniques available now a days. Based on which marble technique you choose to try, the supplies and materials may hugely differ. I personally have done nail polish marbling, shaving cream marbling, acrylic paint marbling and even food safe marbling. 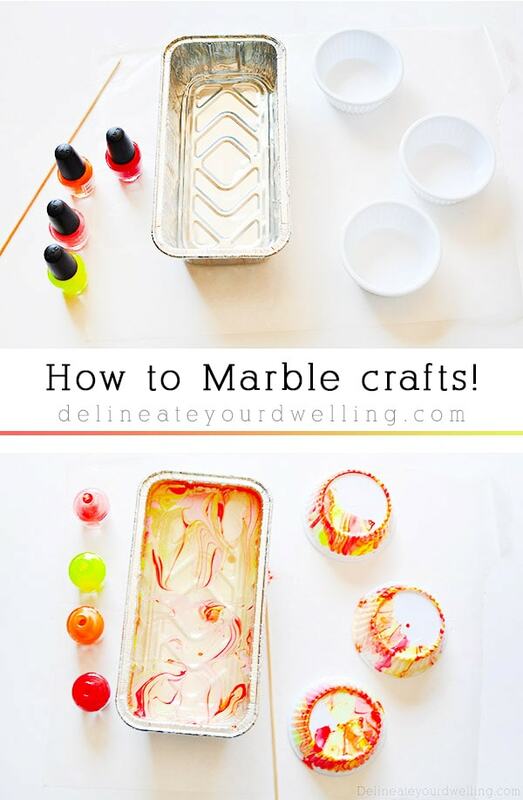 You can marble with nail polish, which I believe is one of the most common marbling craft methods. When doing marbled projects with nail polish the materials you will need are fairly simple. 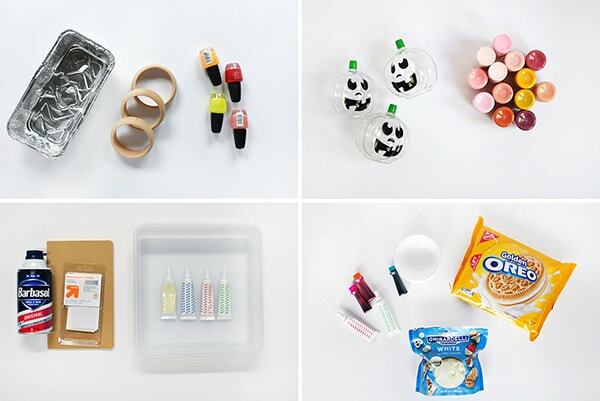 Grab a few of your favorite nail polish colors, a disposable tin or plastic tray, wooden skewers to mix the paints, water and your item to marble. 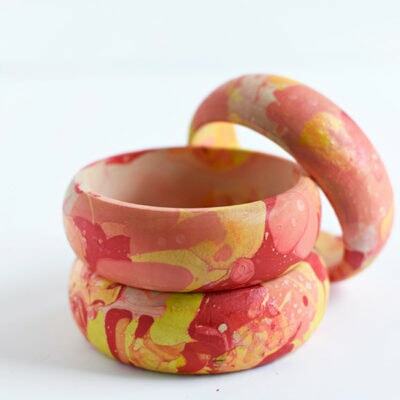 I marbled these gorgeous wooden bangles using nail polish. 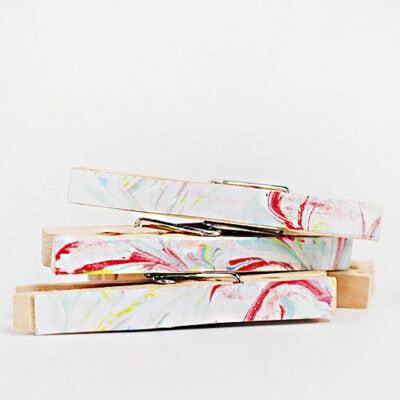 Although marbling with nail polish is smelly (be sure to work in a highly ventilated area), the supplies are very inexpensive and the end product looks absolutely stunning. I also like that the dry time for nail polish marbled projects is pretty fast compared to using acrylic or pour over paints. 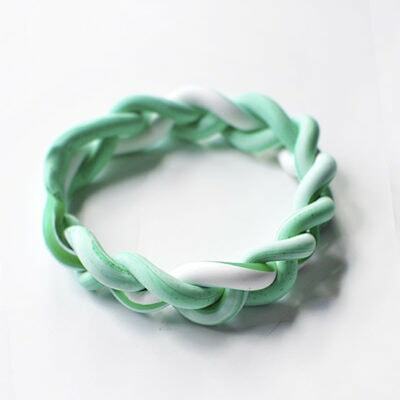 You can also marble using shaving cream. The main supply for this technique is good old fashioned shaving cream. Be sure to look for the foam shaving cream, not a gel shaving cream as the gel will not work. 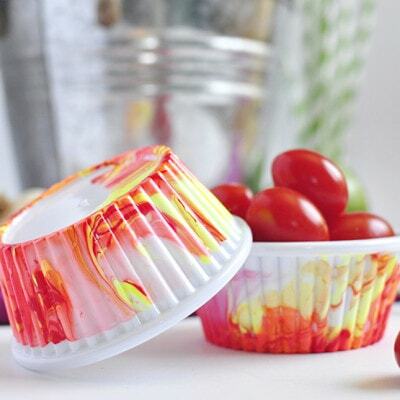 For shaving cream marbled projects, you also will need food coloring (I use simple liquid drops), a wooden skewer, a disposable tin or plastic try and your item to marble. I DIY marbled these canisters using shaving cream and many people loving dying Easter Eggs with shaving cream. You can also marble with a pour technique, which is becoming very popular! I still need to try this method out for myself, but there are tons of great resources on pour marbling. 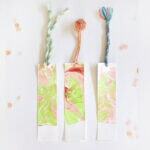 I have done a handful of projects on my blog marbling with acrylic paint. It can be a little bit trickier, but definitely can be done. 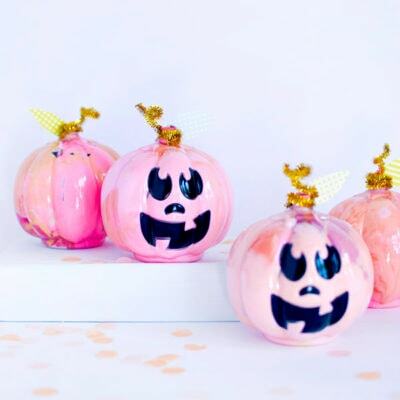 I have done a few marbled jars and even these adorable pumpkins were marbled with acrylic paint. But least you think marbling with acrylic paint is hard, my entire Marbling book I wrote was done using acrylic paint!! So not only can it be done, but I’ve got 8 great projects you can check out now. 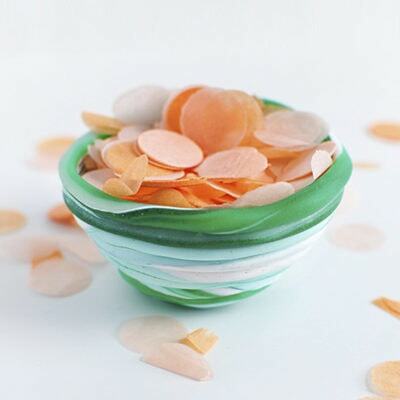 Get ready for this, you can even marble using food products! 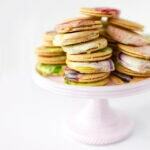 I have marbled oreos and marbled shortbread cookies – both were exceedingly delicious. 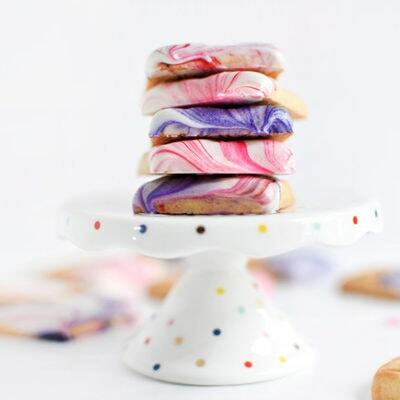 Important Note : Make sure for all edible marbled items that you use EDIBLE materials, like food coloring or gels and white melting chocolates. 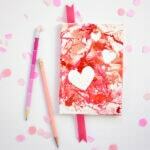 What are the best marbling craft ideas? 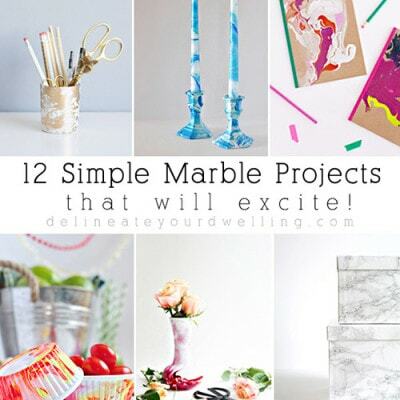 Seeing as how I have well over 20 marble projects well over 20 items, the real question is what can’t you marble? I would say just about everything can be marbled! What kind of items can you Marble? 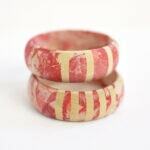 I have marbled all kinds of wooden items, like wooden bracelets and wooden bangles. 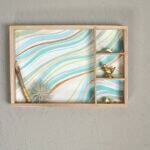 I have marbled wooden shadow boxes and even wooden clothespins. You can marble paper like these marbled heart notebooks, marbled DIY canister and a marbled notebook that I marbled sticky labels and adhered them. You can marble on fabric, but in my case, I painted a marbled pattern on fabric! 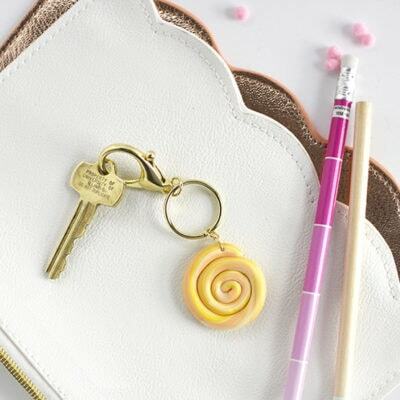 You can create the appearance of marbling on items like clay. I made these fun Clay Plant Holders, a Braided Clay Bracelet, a Mini Coiled Clay Bowl and even a marbled Clay Keychain. And you can even marble food items! So far, I have marbled three different cookies… and as if cookies were not already a tasty treat, try dipping them in even more chocolate. I have marbled vanilla oreos, shortbread cookies and thin vanilla oreos! 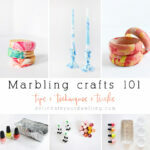 How do I do Marbling crafts? For a detailed tutorial on how to marble with nail polish, see my Marbled Party Cups or Colorful Marbled Bangels. For a detailed tutorial on how to marble with shaving cream, see my DIY Marbled Notebook or Marbled Canisters. 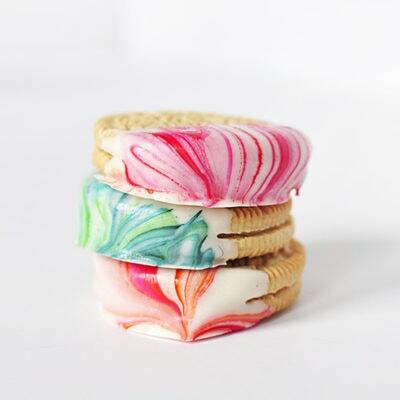 For a detailed tutorial on how to marble food, see my Marble Dipped Oreos (yum). What are some basic MARBLING TIPS? 1. You will probably need more space to marble that you think. 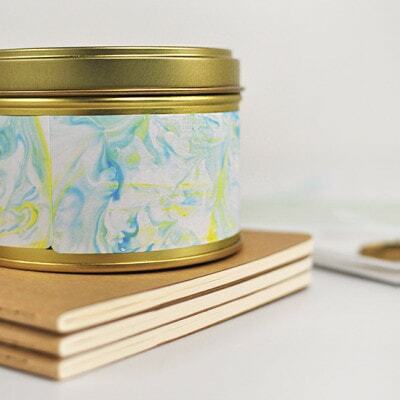 Unlike many other crafting projects, marbling requires an area to hold all your supplies, an area to actually do the marbling technique and then an area to allow your wet marbled item to dry. 2. 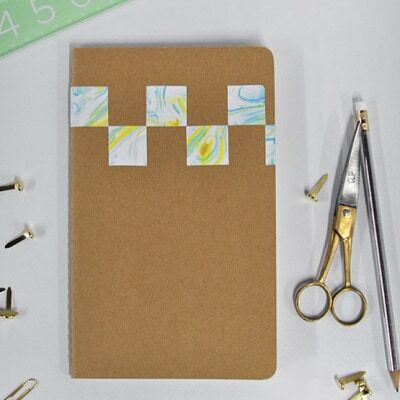 Prior to starting a marbled project, lay down some plastic or cover your workspace with paper. You will be surprised how many rouge drips of paint, water, shaving cream, nail polish, etc… will be coming off between the dipping portion and the drying portion! 3. If you are doing the nail polish marbling technique, mistakes, errors and even small redo-s can happen with nail polish remover! 4. Do not be afraid to try marbling unique objects! Once I fell in love with marbling, I would just look around the room for additional items to marble. I’ve just grabbed a few pencils and dipped them just to see if they worked… any they did! Be brave, marble away! Looking for some of my favorite Marbled projects? Hope you are inspired by them!